What do you think of when you think of an extended family? Cousin Julie, Uncle John, Nanna and the rest? Or a group of related birds or mammals which is broader than a species but narrow enough to be a natural grouping? 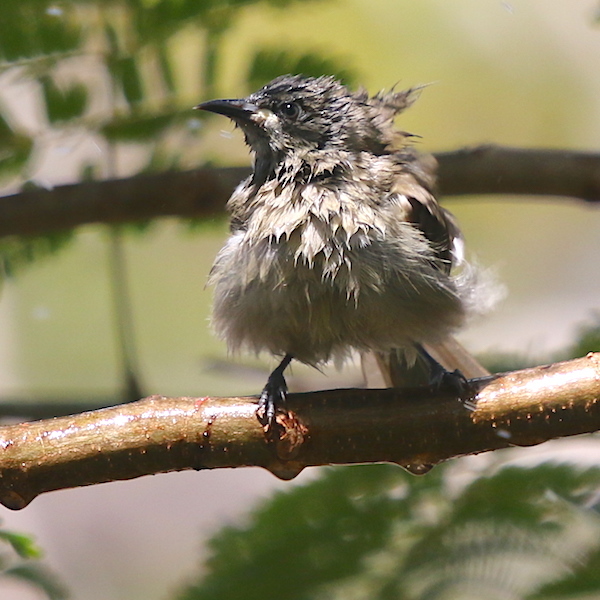 We have been enjoying the company of at least three young Blue-faced Honeyeaters, Entomyzon cyanotis, since returning from a trip to Canberra and Melbourne before Christmas. They are probably siblings and quite likely the offspring of our resident adults. The cheek patches give away their age. As I’ve noted before, they change from a yellow-brown to a pleasant camouflage-green and then to vivid blue as the birds mature.